At the release of its new 9.7 inch iPad Pro, Apple presented a video of Dillan, a young man who is both autistic and non-verbal, who was able to begin expressively communicating via apps on his iPad. Today, the App Store is featuring more of Dillan's story and a range of apps developed for autistic people. Apple has a featured page on its website recognizing April as Autism Acceptance Month. The site includes both a link to ResearchKit studies (including autism work being done at Duke University and University of Cape Town) and autism related apps, podcasts and iBooks that can be found in the App Store. Apple points out that that CDC notes that 1 in 68 U.S. children are affected by autism spectrum disorder (ASD). iPad in particular has generated positive feedback from parents, therapists and Autistic children and adults themselves as being a breakthrough communication tool, as featured in the "Dillan's Path" video below. Apple's "Voices of Autism" collection of apps in the App Store includes Proloquo4Text, a text‑based AAC (Augmentative Alternative Communication) app demonstrated by Dillan in the video. Proloquo4Text presents a customizable single screen layout to enable non-verbal people to join a conversation using free, natural-sounding voices in 18 languages, with word and sentence prediction, social media sharing and more. The app works on iPad, iPhone, iPod touch and Apple Watch, and is currently featuring a 50 percent discount over the weekend from Saturday, April 2 to Monday, April 4. 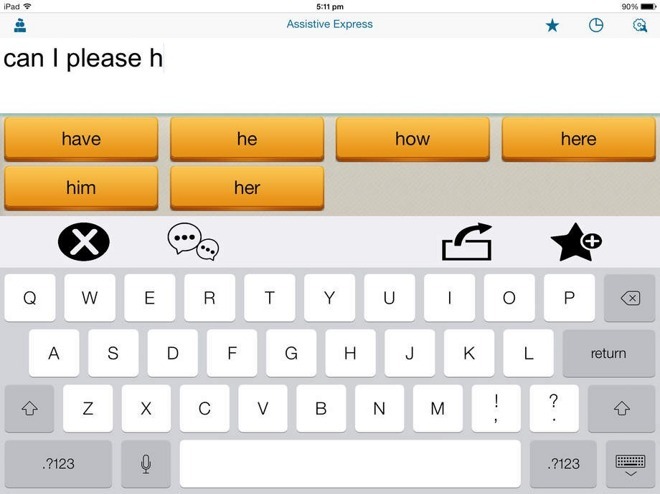 Another app, Assistive Express, is also designed to allow users to express themselves in natural sounding voices in the most simple and efficient manner. It uses word prediction to minimize keystrokes and features a favorites list to quickly access often-used phrases. It works on iPad, iPhone, and iPod touch. 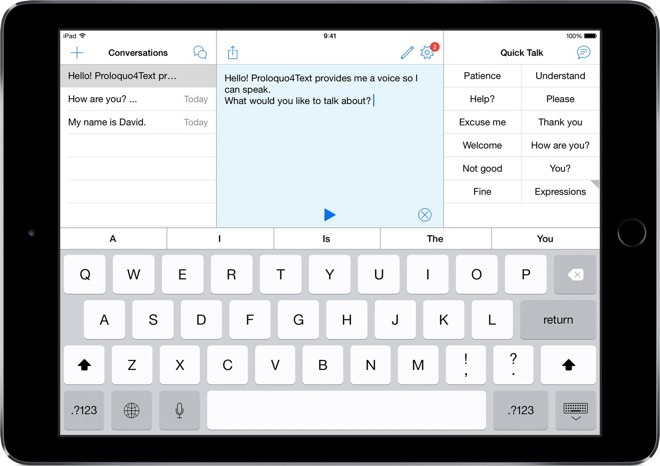 Apple also featured Keeble, an iOS accessible keyboard for iPad, iPhone, and iPod touch that Dillan uses in the video. 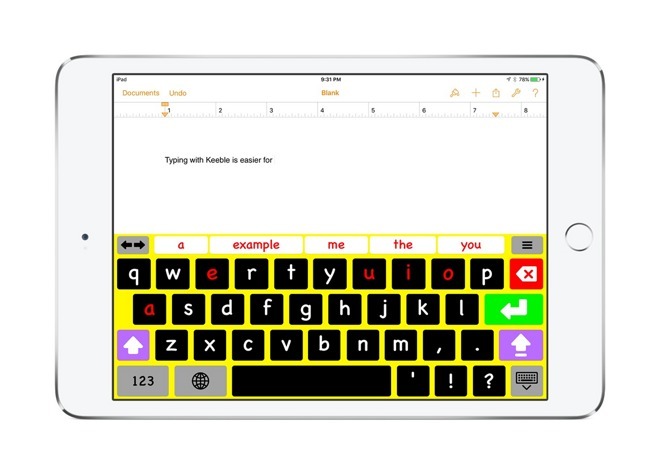 The Keeble keyboard features many customization options, and is designed to enable people with physical or vision impairments to type within any app. Accessibility has long been a primary focus for Apple, and its its efforts in promoting and facilitating use of its products by all people regardless of their disabilities has regularly been recognized by accessibility advocates and individuals with impairments--including blind from birth performer Stevie Wonder, who praised Steve Jobs back in 2011, saying "his company took the challenge in making his technology accessible to everyone." Last December, Tim Cook drew attention to the Cerebral Palsy Foundation using Siri, and over the past year the company directed prominent attention to accessibility features in Apple Watch and iOS devices for Global Awareness Accessibility Day and 25 years of the U.S. Americans with Disabilities Act.